Hi, would like to ask those who uses wild yeast to make bread, for 250g of flour, how much yeast do I need to add? I received some of the wild yeast from Gina. I added about 1 tbsp (6%) of it at room temperature. The bread did not rise after 45 minutes. It set me into panic mode and added some dry instant yeast instead. There must be something I did wrong. Was the yeast sufficient? Using natural yeast (sourdough) to make bread is different from using instant dry yeast. It is not "instant", it takes a much longer process but produces flavourful bread that has better keeping qualities. Since you are doing it the first time it is best to start with a recipe specifically written using sourdough. You can of course convert a yeasted bread recipe to sourdough but first you need to understand how sourdough works before you can do that. Back to your question about using sourdough. Firstly, the sourdough starter needs to be fed before you can use it. Feeding it increases the number of natural yeast which will work on your dough. A simple way is to take 10g of your starter and fed it 20g water and 20g flour (this is 100% hydration). 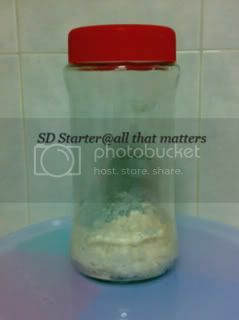 Put your starter in a small glass jar and add the water; stir to dissolve the starter. Add the flour and mix until you get a thick batter. Mark the level of your starter and the time on the jar. Cover and set aside on your kitchen counter. When the starter doubles in volume and is bubbly - check your marking on the jar, note the time it takes to reach this stage. Mine takes between 4 - 6 hours depending on the temperature. For optimum strength do a second feeding. You now have 50g starter ie (10+20+20). Always double your starter at each feeding. Now feed it 50g water and 50g flour. Again mark the level of your newly fed starter and the time. When it doubles in volume your starter is ready for use in making bread. You now have 150g starter. Or say, you recipe calls for 200g starter. At the second feeding, you can try to make up your starter so you have enough for the recipe plus some leftover for your storage starter. So with your 50g starter, you feed it 80g water and 80g flour. This will give you 210g starter. Use 200g in your recipe and feed the remaining 10g with 20g water and 20g flour. Cover and keep it in the fridge until your next bread making session. Then repeat the steps above. Your natural yeast will keep multiplying and working for you. This may seem like a long process but it actually does not take much of your time. You just need a little planning ahead. Here is a sample of my bread making schedule. Make bread according to recipe. Mike Avery is a very experienced baker and teacher and his site is very helpful for novice and amateur bakers alike. Chips, many thanks for the reply. I know what went wrong. I compared orange with apple. Ahahah. Now I understand. I will make another attempt. Sorry, but I have further questions. Let's say I made the starter but didn't have time to make bread (I usually bake at night). Should I leave the starter out or put it to sleep in the fridge? Will it continue to double if I leave it out on the counter? If I put it to sleep, do I have to re-feed it before I use or I just leave it out and use when it reaches room temperature? After you feed your starter, the yeast will start feeding on the flour and multiply. There will be a point where they will reach their peak -- it will have more than doubled in volume and you will see a slight dome. This optimum level will last about 2 - 3 hours at room temperature after which the yeast will start to die off and the level of the starter will start to fall. When that happens it needs to be feed again before you bake. If you plan to delay baking after feeding your starter, you must put it in the fridge. The cold will stop their activity and provided you put the starter in the fridge when it is at its peak you should have no problem using it 24 - 48 hours later. I normally use the refreshed starter straight from the fridge. I want my bread to raise slowly to develop better flavour so I tend to use room temp. water too. I should also warn you that your bread will not double in 45 minutes using sourdough. Depending on how active your starter is and the % of refreshed starter to flour in your recipe be prepared to wait between 1 to 2-1/2 hours at 30C for each proof. Currently I am making bread. I mixed the dough at 3pm and I am still on the first proof after 3 hours as my recipe calls for 200g starter to 800g flour. This morning I made another batch and it took 5 hours from start to finish baking. This recipe calls for 550g starter to 700g flour. See the difference in timing? Hi Chips, thanks for providing the link to the website and answering my queries. I have a better picture now. 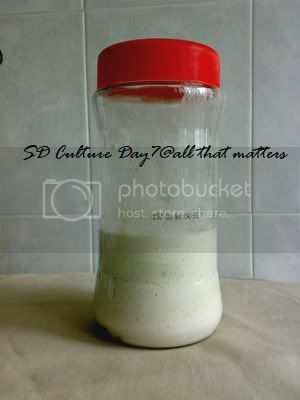 I've just tried to make a new batch of the sourdough culture. I used 50g water and 50g flour to try out first. I think I 'starved' the batch that Gina has given me (sorry Gina.. ) after reading the given website. Will post the progress if possible (handphone low batt). 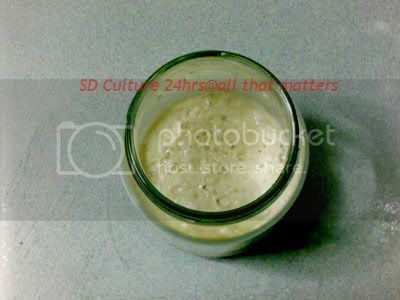 I've just tried to make a new batch of the sourdough culture. I used 50g water and 50g flour to try out first. 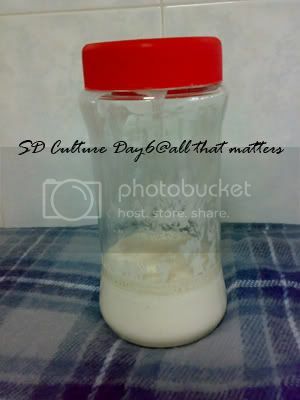 You are very brave to jump in and start your own SD culture. Do read up as much material as possible so you have a better chance of success in your SD venture. Came home and was welcomed by this! I'm going to discard some and feed it later. Oh, I used de-chlorinated water. Nope it's not. It's currently infested with micro-organisms. Updating on the progress. Finally reached day 7. I've got my own starter! A farewell pix before I pour away some and feed it. After feeding, almost doubled in size. It's ALIVE! Another farewell pix before I ask my helper to stash away in the fridge after it reaches the peak while I am at work. Probably feed the starter again on Friday evening and start baking my 1st sourdough. Thanks Gina for inspiring and Chips for the detailed explanation and insight. good job! ..err, mine, I haven't restart yet. Coz too busy fermenting wines! Congratulations Reirei, looks like you have a very happy and bubbly starter. You now have a new "baby" to care for and it will reward you with delicious bread. Can I suggest that when you put your starter away for storage make sure the sides of your jar is clean. 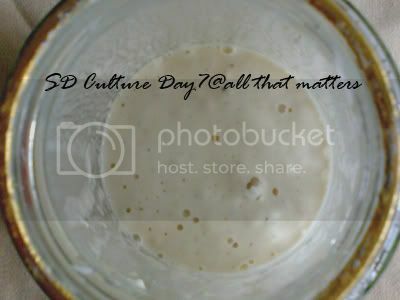 While your culture is full of good beasties the sides of your jar with the dried out culture may not have enough to inhibit molds and those nasty green things may take hold there. Take 15g active starter and add 30g bottled water then stir in 50g flour. This is 60% hydration at feeding ratio 15:30:50. For storage starter you do not need to wait until it has doubled. Just put it in the fridge after you have mixed and the yeast & bacteria will sloowly feed on the flour. Kept this way, I have neglected my starter for more than a month while away on vacation and it still comes back vigorously when I take it out to feed. Thanks for the tips, Chip. Will do. Here's the fruit of my labour. I started out feeding the starter on Friday night 10.30pm. 2nd feed was about 8a.m. Started bread making at around 2.30p.m, ended at around 8.30p.m. I didn't grease my tray. 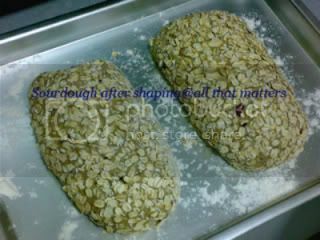 I coated the entire bread with roll oats instead and dusted some flour on the tray. After shaping, waiting for 2nd proof. 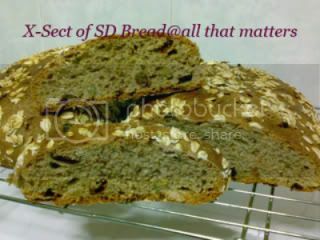 I used this recipe http://www.sourdoughhome.com/flaxseedbread.html but made some adjustments. The bread is soft but chewy. Love the texture. I need to make further adjustments as my bread had thicker crust. I quartered the recipe and yielded about 2 loaves (about 1 kg of dough before baking). Can't imagine myself kneading the entire recipe by hand. I also stored the starter using the ratio Chips provided. I forgot to take the picture of the starter after 2nd feed though. Nice healthy looking loaves, Reirei. Glad you like it. Naturally leaven bread tends to have a thicker crust and a chewier crumb. If you don't like the thick crust, try using softer flour, say about 11% protein or a mixture of bread and plain flour. At what stage do you feed your storage starter? I am a little puzzled when you said you forgot to take pic after 2nd feed. Naturally leaven bread tends to have a thicker crust and a chewier crumb. If you don't like the thick crust, try using softer flour, say about 11% protein or a mixture of bread and plain flour. hi Chips, not that I'm complaining. Hah.. I actually like it chewy. Not sure about my mom though. The 2nd feed I spoke about was before baking. In my excitement, I forgot to take picture of it. I fed the storage starter after I took out what was needed for baking. Whew! You did good. I was worried you were doing a second feed for the storage starter . You are a fast learner. Last Feb I taught my 80 year old mum how to bake with sourdough too. She and my Dad are proud as punch each time they successfully baked bread. If you are interested in trying different recipes I am more than happy to share with you some of my favourites. Hi Chips, been busy and missed out this topic. Would appreciate if you could share some of your faves. My mom actually likes it better than those bread I baked using instant yeast. TIA. Just to check. This wild yeast, can they be use for all type of bread recipe or only certain type only? oh dear..just happen to see Flowerangel's reply. Wild yeast can be use with any kind of bread you wanna make. Basically, its just yeast. replacing those you buy off the shelf.